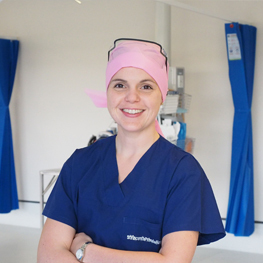 In 2010 Sinead commenced as a Registered Nurse in Surgical Services at St Vincent’s Private Hospital Sydney. She is dedicated to both patient and staff safety. Her dedication stems from her genuine desire to improve quality and safety for patients, families and staff in healthcare. Sinead’s personal and professional values and beliefs align with the Mission and Values of St Vincent’s Health Australia. As a professional working in healthcare with over 11 years of experience, Sinead have demonstrated the ability to work autonomously and in a team environment. She has taken every opportunity to gain both technical and interpersonal skills and extended her knowledge in Surgical Services and Anaesthetics and Recovery. These interpersonal skills and her leadership and managerial ability led Sinead to be supported to apply for and gain the role of Associate Nurse Unit Manager in Anaesthetics and Recovery. Sinead has been involved in numerous practice and quality improvement initiatives in Surgical Services and facility wide. In particular Sinead has taken the lead in developing and implementing the Massive Blood Transfusion Protocol across the facility. This involved leading a team to research best practice in patient blood management during an emergency and communicate this information and gain consensus with all stake holders in the multidisciplinary team. This led to the development and implementation of a protocol, data collection form and auditing tool and has improved practice related to Massive Transfusion right across the facility. This project is reflective of Sinead’s capacity to professionally develop and extended her knowledge in project and change management, stakeholder engagement and the analysis of data to inform and influence business decision making and quality and safety improvements. Sinead is an integral part of the management Nursing Team within the Surgical Services. She works closely with the highly professional multidisciplinary team to provide a high standard of patient centred care. She strives to improve her skills and the skills of her colleagues. Sinead is interested in technology and making it available for our patients. She is committed to St Vincent's Private Hospital and she wishes it to do well. She looks for ways to improve the business and advance optimal patient care.